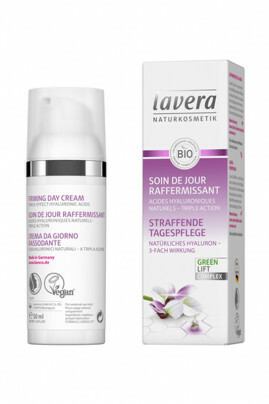 Lavera Vegan Firming Day Care intensively moisturizes and naturally stimulates the collagen production of the skin to reduce aging and sagging skin. Thanks to its natural complex Green Lift, this cream firmifies and smoothes the skin durably while protecting skin cells from free radicals. Rich in karanja oil and hyaluronic acid, your skin regains its suppleness and hydration. This organic regenerating treatment fills in the lines and wrinkles of your face. Pleasant to apply, its texture penetrates quickly and leaves your skin very soft. With Lavera Vegan Firming Day, your skin is toned and plumped. A day cream to adopt for demanding skin! In the morning on previously cleansed skin, apply the creamon your face and massage in gently.